Fraser Nelson has published a piece in the Spectator today in which he declares Lord Gus O’Donnell was misleading the public with his comments about the time it would take to negotiate a new agreement with the EU. Nelson states that O’Donnell made the point it would take more than two years to negotiate the terms of the UK’s exit from the EU and that the deadline could only be prolonged, in Nelson’s words, ‘with hard bargaining from hostile partners’. Nelson then declares that there’s only one problem with O’Donnell’s argument, ‘it’s nonsense’. The problem however is with Fraser Nelson’s argument, because O’Donnell was absolutely right on this. It’s a fact that once notification has been given to the European Commission that the UK is leaving the EU, as set down in Article 50 of the consolidated treaties, only two years is guaranteed for negotiation of a new post-Brexit relationship. That duration can only be extended through the unanimous agreement of all member states and the UK. If there is no unanimity, the formal negotiation ends after two years and the UK ceases to be a member of the EU. O’Donnell didn’t stray from this. It is Nelson who is misleading people with his laughable argument that the UK can take all the time it wants to leave the EU. He’s right that Britain could give its notification to leave at any time we choose. But he claims if we want six years before leaving we just give notice after four years and that, ‘The two-year period is a minimum, which Sir Gus is misrepresenting as a maximum’. What Nelson is ignoring or doesn’t understand, is that there would be no formal negotiation with the EU regarding the new post-Brexit relationship. So this hypothetical four-year hiatus that he puts forward would be dead time with no movement towards Brexit. What would be the point of that? He’s trying to separate the notice period and the negotiation timetable, when they are the same thing, in an effort to prop up the Vote Leave ‘Project Fear’ narrative. And he is, as a Europhile, happily damaging the leave side in the process. If you’re reading this, Fraser, until the Commission receives Britain’s notice to withdraw from the EU, it would not begin discussions between the 27 other member states to agree a common negotiating position for the bloc. It stands to reason it couldn’t do so because it wouldn’t know what the future situation might be regarding matters on trade, directives in force, the economy, other agreements being brokered with third countries etc. Your attempt to land a blow on O’Donnell only makes you look ill-informed and ignorant of the process. Consider this. One thing that has always been an issue is that Britain cannot not force any formal negotiation without giving notice to leave. All Britain can (and should) do is speak to other member states on a bilateral basis to get a feel for what they want from a new agreement and what they are willing to give. That could realistically take 9-12 months to do properly, to help Britain formulate its own position for the formal negotiation. But nothing can be discussed formally with the EU as an entity until it has an agreed common position – which could (and likely will) include things some member states won’t want and exclude other things that they do. Indeed, that’s the problem with compromise and supposed shared sovereignty and part of the reason we should be leaving. So while Fraser Nelson pontificates that the EU wouldn’t have a gun to our head on the negotiation, and that the two-year period is only a notice period - and not also the formal negotiation window it is, which can be kept to two years if even a single EU member state refuses to extend it - he is wrong and Gus O’Donnell is right. This morning I was preparing a blogpost responding to the comments of John Redwood about his ill-advised promotion of an unrealistic 'first post Brexit budget', when the first news reports broke of explosions at the airport in Brussels. As soon as it became clear there were two blasts in different parts of the airport we knew this was a terrorist attack. The third explosion at the metro station near the European Commission and the Council buildings dispelled any doubts. By then there were already people taking to the internet using the attacks to variously dismiss or ridicule David Cameron and the remain campaign's central argument that we are safer as a member of the EU. It's impossible for those who were not there to imagine the horror the victims experienced in those blasts. Their awful experience was not something to be used as a political football just minutes after the event. We should be taking a moment to spare a thought for them and their loved ones. Too many tweeters were indecent in their haste to make political capital out of mass murder, as the dead and dying were still being recovered or rescued. It was selfish, needless, distasteful and disrespectful. One wonders what goes on in their heads when they take advantage of an act of intolerance and hatred to exhibit some of their own. Where is their self control? There is nothing they could say at that moment, as dozens of human tragedies were played out in the terminal buildings and at the station, that could not wait until worried families, friends and co-workers could be told if their loved ones were alive or dead. Not all, but most people, I am certain, will be appalled by the insensitivity and enthusiasm shown by some to make political points that fit their agenda. There is a time for criticising and refuting assertions made by our opponents regarding their claimed benefits of EU membership. This morning wasn't it. It can wait until later on. Turning people off with such behaviour doesn't help our campaign, it undermines it. For a number of weeks now several sources have said that Flexcit, has been doing the rounds in the higher reaches of the civil service. While David Cameron and his pro-remain friends have been claiming no one has set out what 'out' looks like, many around Whitehall have been reading and taking on board this supposedly non-existent Brexit plan. As such, it is likely the UK would adopt a model similar to Norway’s as holding position, before gravitating to a more bespoke arrangement, according to one scenario under discussion. This is Flexcit in a nutshell. It's the staged process writ large. The reason it is the only analysis mentioned in the piece is that it's the only one being taken seriously by the experts who would advise and steer the government in the event of a leave vote. It is grounded in what is legal, what is possible and most important of all, what protects British interests, jobs and the economy. Other leave groups have danced on pinheads in an effort to avoid promoting any plan that would, when scrutinised, expose their lack of knowledge. Their fear is that it would be an Aunt Sally for the remain camp would throw things at. However, the newly launched campaign, The Leave Alliance, is proudly waving the Flexcit banner in its newly shortened pamphlet format called The Market Solution (free electronic version). The full version of Flexcit, running to over 420 pages, has been downloaded and read tens of thousands of times. 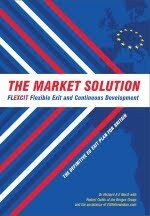 The Market Solution at only 48 pages, makes it quick and easy for people to understand how Britain can leave the EU, while providing vital reassurance to voters, business and the markets that Brexit can be de-risked and that there will be no leap into the dark. Download your copy today and learn how Britain can leave the EU and re-establish its place in the world without the negative consequences David Cameron claims would follow. See what 'out' looks like. LONDON, 18 March 2016 – The Leave Alliance has launched in London with a definitive Brexit plan and a positive vision for a United Kingdom freed from European Union control. At its official launch in London on Wednesday, representatives of the seven groups that make up The Leave Alliance dismissed as unnecessary and misleading David Cameron’s warnings that jobs, commercial interests and British influence in the world would be lost if the UK voted to leave the EU. The Leave Alliance presented its plan, called The Market Solution, which details how the UK can leave the EU but remain a member of the European Economic Area (EEA, or Single Market) until a more permanent solution can be negotiated. The approach enables trade and commercial links to continue as they do today, providing vital reassurance to business and the markets that Brexit can be de-risked, withdrawing from EU political control without impacting the economy. Anthony Scholefield, the Director of the Futurus think-tank said, “The Leave Alliance is an antidote to the fear, uncertainty and doubt that is being sown by those who want to stay in the European Union. After giving notice to withdraw as set out in Article 50 of the Lisbon Treaty, we have shown how we should use the two-year period that follows to negotiate an agreement to remain in the single market after we leave the undemocratic and outdated EU. Dr Richard North, political researcher and author of The Great Deception and the specialist blog EUReferendum.com said, “An effective strategy is essential. What sets The Leave Alliance apart is our plan, The Market Solution. It debunks the arguments of those who want to remain, it offers a positive vision for how the UK can leave the EU, and it reassures people that we can withdraw from the EU without the negative consequences David Cameron claims would follow. The Leave Alliance (TLA) is made up of seven groups; The Campaign for an Independent Britain (CIB), The Bruges Group, EUReferendum.com, FUTURUS think-tank, Save Britain’s Fish, The Harrogate Agenda and the Blogger’s Army. 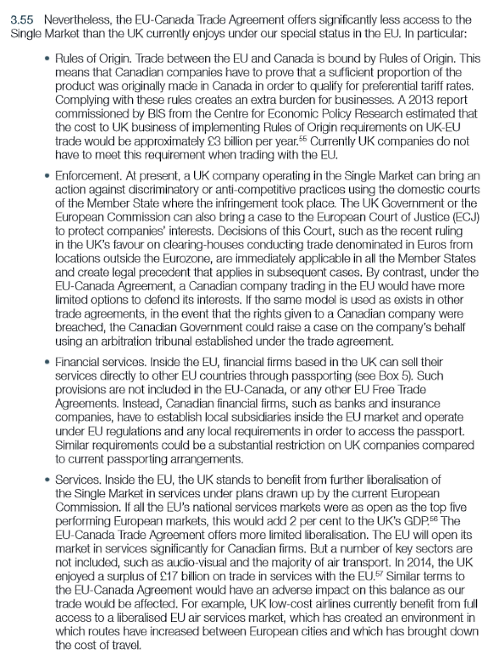 TLA advocates and promotes ‘Flexcit’, a clear, researched and de-risked six-stage plan for UK exit from the European Union, but remaining a member of the European Economic Area (EEA, also known as the Single Market) until a comprehensive free trade agreement (FTA) can be negotiated. TLA is not seeking Electoral Commission designated lead campaign group status and is not competing with any other ‘Leave’ group. It will support and work with any of group that supports the need for a detailed and seamless exit plan and our vision of how we can prosper after leaving the undemocratic and bureaucratic EU. (ii) To ensure our trade and commercial interests are not interrupted while we negotiate for a new free trade deal for the 59 countries of Europe, as opposed to the 28 in the EU. Voters need to be made aware that the EU is now at best irrelevant and at worse a deterrent to trade as global bodies increasingly determine and produce the rules and regulations governing world trade. Just whose side are the Tory eurosceptics really on? David Cameron has criticised Boris Johnson’s suggestion that the UK could mimic the limited Canadian free-trade agreement with the EU. Cameron pointed out that Canada has been negotiating its agreement with the EU for seven years, and that such a long period of uncertainty was not an option for UK businesses. This is what happens when people who have been completely disengaged from the subject for years jump in with any old comment. People like Johnson hunt around on Google for a few minutes, find something that superficially looks plausible (when not simply making things up) and present it as the kind of solution we should aim for. Minimal effort, substantial coverage, maximum avoidable harm to the campaign. And there's plenty more where that came from. If Johnson and his ilk were genuinely committed to winning the referendum and taking Britain out of the EU, surely they would seek to advocate a plan for the government to follow that takes us out of the EU but enables us to remain in the single market (EEA) until such time as the end goal - a detailed comprehensive FTA - can be negotiated with the EU. Such an approach would de-risk Brexit when it comes to the economy and jobs, and would deny Cameron and the Remainiacs the opportunity to play their trump card - fear. Given that Vote Leave refuses to advocate a plan and won't budge from its insane scorched earth vision of ditching the EEA, it is entirely appropriate to ask if these people are on our side at all. Vote Leave has become a magnet for many Tory eurosceptic MPs who are long on self promotion, short on knowledge and possess no desire to understand what Brexit really entails or acquaint themselves with international trade and its rules before talking about it. This is why the likes of Boris Johnson, Chris Grayling, and Graham Brady damage the campaign when they limit the arguments to a narrow focus on trade with the EU, and still get it badly wrong. Theirs is the "It'll be alright on the night" campaign, but the reality is it won't if they screwing us. These levy and trade issues are important, but are a minor issue in the overall scheme of things when compared with our future need to cooperate with the EU on inter-agency matters such as medicines, trademarks, aviation safety. Then there’s air traffic control, European single sky, maritime surveillance, Customs, environment, and any number of other areas where the new post-Brexit relationship will require new agreements on coordination and cooperation to be established. Vote Leave is owned, was created and is still led by two Tories who have never publicly called for Brexit, only to stay in a reformed EU. It has never made a single call to leave the EU on their website or in any of their many briefings, updates, flyers and other materials. Instead of stating they want Britain to leave the EU, they fall over themselves to carefully use language that falls short of that objective, talking instead of only a leave vote and of 'taking control' and only calling for the repatriation of some, not all, powers. The Vote Leave crowd don't even master the very basics. For example, its student arm, 'Students for Britain' looks forward to Britain regaining its seat on the WTO. We never lost our seat at the WTO. Vote Leave's chairman, Lord Lawson, vehemently stated on the BBC that the EU isn't a member of the WTO. It has been a full member since January 1995. Vote Leave's campaign director, Dominic Cummings, has even bizarrely claimed that the treaty-bound mechanism to be followed if leaving the EU, Article 50, isn't the best or only legal method for terminating our treaty commitments. 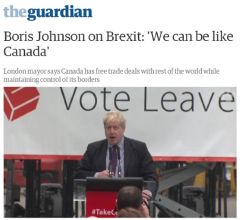 Now add in Boris Johnson's completely ill informed and self defeating endorsement of CETA, opening the door for a gleeful David Cameron to give the leave side another punch in the face, and Michael Howard's comments that we can vote to leave to make the EU gives us more crumbs from the table, and you see a big picture where Vote Leave, the front runner for official designation seems to be doing all it can to undermine its own campaign objective and lose us the referendum. Ask yourself, are these the actions of a group that is determined to win and get the best for Britain? Or is there an agenda at play which will hand David Cameron an undeserved victory that will be bad for democracy and bad for our country? I’ve not been blogging as much as I should have recently. I’ve run into a very busy phase of a project for a global client and the long hours have just left me too tired to blog at night. But compounding that is a cloud of misery hanging overhead, which has been produced by the politicians running amok on both sides of the referendum campaign. It’s times like this we should remind ourselves why we have so little respect and time for the political class. On one side we have a group working feverishly to make voters scared of leaving the EU while pretending that remaining in the union will mean things stay as they are today. On the other, we have a group whose sole contribution to the campaign has been to shout the word ‘scaremongering’ in response to every claim made by the remain side, while making absurd assertions about Britain’s trade status after Brexit. Neither side is giving voters an honest, reasonable, accurate or factual picture. The politicians have turned the referendum campaign into a playground of dishonesty, ignorance, fallacy and delusion. The politicians have welded themselves to arguments and claims that are variously distorted, inaccurate or outdated… sometimes a mix of all three. They repeat mind numbing mantras such as ‘stronger in’ or ‘take control’, but run scared from presenting any vision or plan, because in reality they haven’t got a clue what they are talking about. So they continue, stuck in transmit mode, refusing to listen to anyone or anything that doesn't confirm their position or smother them in adoring praise for what they believe to be their statesmanship and superior wisdom. This isn’t serving the interests of the voters, who are hankering for evidence and factual detail on which to base their choice of whether to leave the EU, or remain in it. Let’s take just one example of the depressing ignorance of the politicians from this week. On Wednesday, on BBC World at One, Conservative Graham Brady was put head-to-head with Labour’s Jon Ashworth. Brady argued we should leave the EU, but also said we should leave the single market (EEA) too because we would need to pay into it and accept freedom of movement of EU citizens. That’s a reasonable position to take, even if I disagree with it. But Brady then underpinned his argument with the illogical claim that because Britain is the fifth biggest economy in the world, we don’t need to be like Norway (in the EEA, not in the EU). Instead, he argues, we can have strike a better trade deal with the EEA than Norway can. Take a moment to break that down. Brady is saying that as a non-member of the Regional Trading Agreement that the EEA is, Britain can get a better trade deal terms with the EEA than an EEA member country can. It is downright fantasy. Ashworth, presented with this open goal against his leaver opponent, ignored the point completely. Instead he changed subject and jumped on a recent remain side hobby horse by saying that British expats living and working in the EU, may be forced to leave those countries if we Brexit. This particular scare story is a complete fallacy. There is established and accepted international law that holds people who have been granted and exercised a right conferred by a treaty, namely being part of the EU with unrestricted right to live and work anywhere within the union, retain that right absolutely even if the treaty is terminated. It is dealt with in the Vienna Convention and is commonly referred to as ‘acquired rights’. Did Brady seize the chance to set the record straight? Of course not. As much as Ashworth was completely clueless about having a better deal with the EEA than one of its own members can have, Brady was utterly ignorant of acquired rights and its status in international law, missing the opportunity to rebut it. How are ordinary voters - who are looking to such exchanges to educate them about what Britain outside the EU means for the country and our citizens abroad - supposed to make an informed decision from such low-grade, ill-informed, fact-free rubbish as that exchange broadcast on the BBC? Going beyond this, we had a bun fight taking place yesterday about tariffs. The remain side are whining that leaving the EU means goods will be more expensive because tariffs will be applied by the EEA on our exports, and by us on their goods coming in. The leave side argued back that tariffs are only an average of just over 3%, that it’s small beer and not really worth worrying about. Both sides are wrong again because of this focus on tariffs and trade. These levy and trade issues are important, but are a minor issue in the overall scheme of things when compared with our future need to cooperate with the EU on inter-agency matters such as medicines, trademarks, aviation safety. Then there’s air traffic control, European single sky, maritime surveillance, Customs, environment, and any number of other areas where the new post-Brexit relationship will require new agreements on coordination and cooperation to be established. Just a hunch, but I think British holiday makers will be more concerned that we have negotiated effective working partnerships with our neighbours to ensure their flights are routed safely across European airspace, than whether we can knock half a percent off the cost of Spanish oranges. Deals can and would be achieved, but would take time out of the two year Article 50 negotiation period where other things also need to be agreed. But the politicians are so damned superficial, these vital issues and considerations don’t even make it on to their radar, let alone permeate their thick, dogmatic skulls. I am bloody angry, and you should be too. We should be bloody angry about the way Cameron on the one hand, and ignorant Parliamentary bench stuffers on the other, are stealing our people’s referendum away from ordinary voters. There is nothing grassroots about the campaigns to date. They are all by politicians, for politicians, with the grassroots asked to clap and cheer them in the right places, and get out and do the donkey work with clipboards and leaflets, while the political star turns waltz in and out of TV and radio studios parading their stupidity. On the leave side Vote Leave, Leave.EU and Grassroots Out are absolutely nowhere on the important matters I’ve referred to above. Too much of the information they pump out is wrong, even on such matters of record as the EU-Ukraine Association Agreement (AA), which Vote Leave’s Robert Oxley claimed took only a month to negotiate. The negotiations began in 2004, the preamble of the AA was only nailed down in 2012 and it wasn’t until 2014 when the articles were finally agreed. The AA itself has only been partially implemented more than 18 months on. Yet such nonsense as Oxley’s claim was enthusiastically retweeted by politicians and hangers on, corrupting the record and undermining confidence in the leave side by anyone who cared to check the facts. The campaigns are infested by politicians who have had ideas in their heads for years and have never updated them to keep up with developments during that time. As such they are spreading rubbish, trying to increase their own profile in a referendum of the people that is being held because the matter is of an importance far too great for Parliament to decide. My final hope for a leave vote, based on accurate information, facts, evidence and honesty, now rests on the broad shoulders of The Leave Alliance. This is a chance to channel the anger into something constructive and positive. Although it isn’t seeking designation as the official leave campaign, it is the only one on the leave side that has a detailed, researched, tested and validated Brexit plan, which addresses and removes the risks that are being played up by the remain side. It would see Britain leave the EU immediately, to remain part of the EEA after re-joining EFTA, for only a transitional period. With jobs and trade protected within the EEA and no loss of ability to trade or increase in the cost of doing so, Britain would then be able to start the lengthy and painstaking process of negotiating a comprehensive Free Trade Agreement with the EU. At the heart of everything The Leave Alliance advocates is the democratic imperative, along with the discipline to present only those things that are realistic and possible in law. Whether there is time to detoxify the leave side and correct the fallacies of the remain side before 23 June remains to be seen. But at least it is the one group that will try to do things the right way. I am giving The Leave Alliance my full support and I hope you will consider doing so too.